The removal of I-980 and development of Oakland Central Station provides an opportunity to improve Oakland’s place in the Bay Area and improve the transportation options of the entire region. Does this read like a fantasy given the current conditions in the Bay Area? The ConnectOakland Vision could be the foundation for this new reality. Intercity travel, whether for employment or vacation, is a fundamental experience of modern life. Although short distances may be efficiently traveled by automobile, in the geographic expanse of California, many travellers must rely on air travel. Air travel requires waiting in security lines and favorable weather. Factor in how long it takes to board and entire plane (effectively in a single file line) and the logistical challenge of arriving at the same place as your luggage after changing planes, and air travel looks less desirable. Modern intercity rail transportation solves a number of these problems: service is only disrupted by the most extreme weather, your luggage always stays on your train, and you don’t have to budget an hour to clear security for a two hour trip. Likewise, rail transit offers advantages over conventional car travel byallowing folks to choose what they do on their journey whether that be reading a book, working on wifi or simply enjoying a drink or a nap. The ConnectOAKLAND plan brings the opportunity for convenient and enjoyable intercity travel to a central location just steps from downtown Oakland. Possible logo for the Oakland Central Station proposed in the 980 Vision showing rail lines all coming together, and echoing the emblem of the City of Oakland. While BART lines are crucial to Oakland, the only current connection between BART stations and Amtrak is far from downtown at the Coliseum station. Likewise, the ferry terminal in Jack London Square is also far from any BART station, echoing the lack of places where you can transfer from one line to another in the Bay Area.. In San Francisco, transferring from Caltrain to BART requires either a 20 minute (1 mile walk), or a 15 minute trip on Muni’s N-Judah that costs $2.50 just to transfer. In San Jose, when BART opens in San Jose’s Berryessa Station, you’ll still be a 30-40 minute bus and light rail ride away from Downtown San Jose — and closing that gap will set you back another $4. Two stations in the BART system currently offer seamless transfers from BART to Amtrak: Richmond and Coliseum stations, however, they are not within walkable distance to a major job center. Connect Oakland’s plan calls for multimodal stations at 14th Street and Jack London that will create stronger transportation hubs – both by bringing BART and Amtrak together, but also for being within walking distance to thousands of Downtown Oakland jobs and entertainment destinations. An “Oakland Central Station”, or dare we name it something more fun like “Oakland Grand Shuffle”, or romantic like the Oakland Grand Concourse, situated in the I-980 footprint will benefit Oakland, the region and the State exponentially more than the current freeway that currently benefits 70,000 cut-through commuters. People traveling on Caltrain and Amtrak from as far away as Sacramento will get direct access to Downtown Oakland itself. An Oaklander living a few blocks away could take a train to visit family in Los Angeles or Seattle.. This connection point will help Oaklanders get to work in San Jose and Martinez residents see a show at the Paramount Theater. Similarly, a new Jack London station near Howard Terminal will also act as a hub between a new underground BART station, and a new street-level Amtrak Station with service from interstate Amtrak service (Coast Starlight and California Zephyr), and intercity Capitol Corridor service. The Amtrak station would be relocated from its current 2nd St and Alice location to the new the BART Jack London station west of Broadway. The Jack London BART & Amtrak Station would have a five-minute walk to the ferry. That’s a walk that’s a hair shorter and closer than the six minute walk between Embarcadero Station and the Ferry Building in San Francisco. 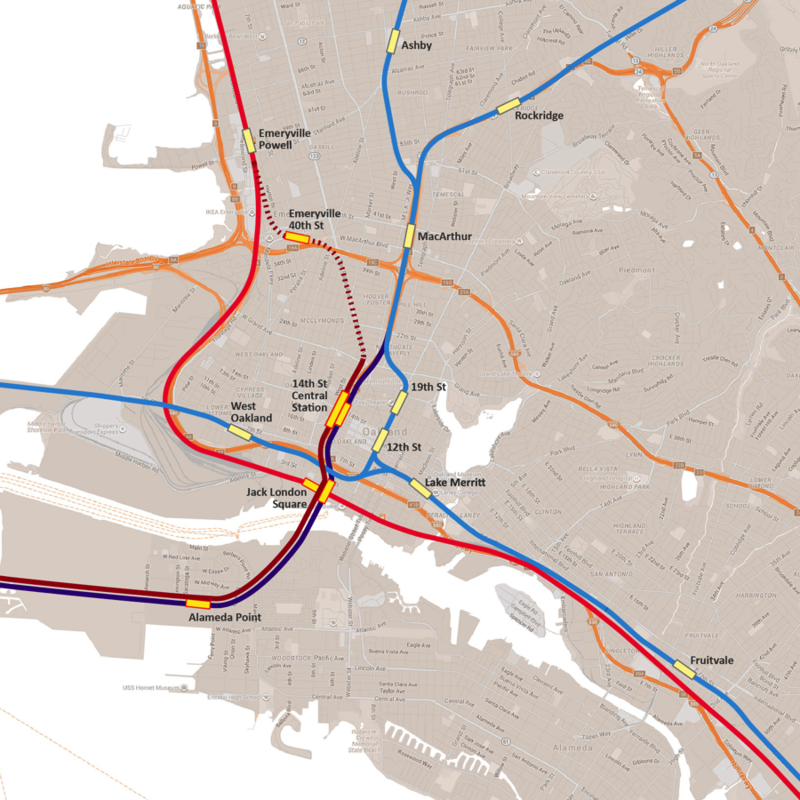 The station would also create a five-minute walk to Broadway, and ten-minute walk to a potential Oakland Athletics ballpark at Howard Terminal. These stations, coupled with the new Transbay Terminal in San Francisco, will create a “dumbbell node” that will not only seamlessly unite the Bay Area’s transportation network, and also tie that network to the State and the Pacific Coast. Oakland could regain its historical role as a great terminus and join Seattle, Los Angeles, and San Francisco as major west coast destinations. Map of 980 Vision and rail accessing the corridor. Could two stations of this scope really get built? Would it work with only some of the pieces? Can the project be phased? Yes, yes and yes. In the next post we will examine how the Connect Oakland vision could start before the second Transbay Tube is built and provide more benefits to Oaklanders and the Bay Area over time. Is it a mistake on the map that regional trains — whatever we call a combined Caltrain/Capitol Corridor service that would bring riders from Emeryville to SF Transbay — don’t stop at the new Jack London Square station? That would seem to almost entirely defeat the purpose if it only serves trains on the “old” Capitol Corridor line from going north-south from Emeryville to Fruitvale. Absolutely a must to have that connectivity for new housing/employment centers at JLS to the entire region — Peninsula, SF, West Berkeley, even Sacramento. Especially essential if there’s a ballpark there. If a new transbay Caltrain can provide frequent service, it might even make sense to add a stop near Market and San Pablo, or shift the Emeryville/40th station to San Pablo. Essentially an extra subway line from Richmond through West Berkeley and Emeryville, straight into JLS, SoMA and downtown SF. It makes sense for regional trains to skip the Alameda Point BART station, though.